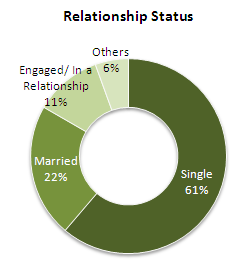 In terms of raw demographics, FindPeopleOnPlus has a lot of data to work with and the findings are quite interesting. 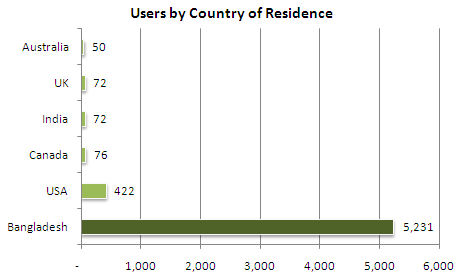 The data on users from or in Bangladesh, reveal the following based on a identified sample of approx. 6,500 users as of date. Google+ users in Bangladesh are approx. 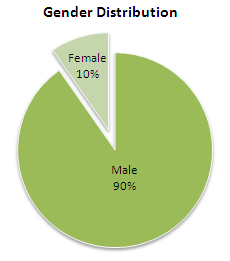 90% male and 10% female; in terms of occupation, 25% students and 7% are IT Professionals, the others are a mix of journalists, freelancers, service-holders, teachers, researchers, doctors, engineers, etc. 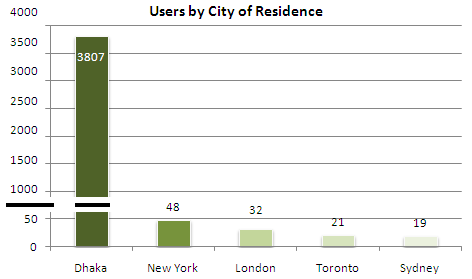 A overwhelming 58% of the users are from Dhaka, Bangladesh, with NYC, New York, USA coming a distant second. The employer (apart from self-employed and students) that has the most Google+ users in Bangladesh is Samsung R&D, which is rather a distinction. The following charts depict part of the statistics.